I am absolutely delighted because today I received not just 1 but 2 parcels from the land of animes and sakura. 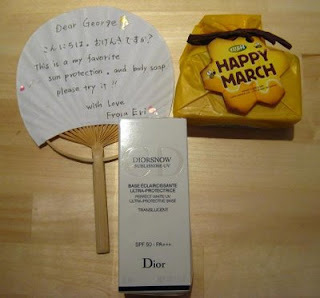 The first parcel is from the Google wife that contains my orders from her online boutique and the kakikayan products that she promised to send me. 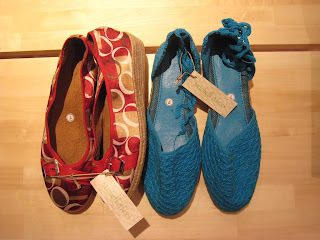 Michell Alexi sandals - tried these shoes on, they're divinely comfortable! You’ll get these (can even be customized to your tastes!) at cheaper rates in the Philippines, just visit Ria’s site. 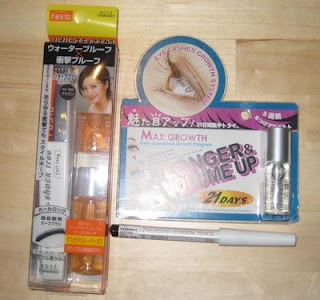 DermaFleece Eyelashes Builder, which guarantees to lengthen the lashes in just 21 days. I really need this! Sad to say I have no lashes that fans the cheeks when I close my eyes. In fact, my lashes are regrettably nonexistent. Mama apparently didn’t trim my lashes when I was still a baby (there’s no scientific explanation if that’s really but many swear it does lengthen the lashes). I asked her of course, demanding why she didn’t trim them. She just told me that there’s nothing to trim in the first place... yeah sometimes she’s not loyal. A brown Shiseido eyebrow pencil, which I hope doesn't smudge. The one I'm using does that sometimes at the end of the day I look like I have a black-eye. and oh! oh! last but definitely not the least... Dior Snow Sublimissime UV Protection SPF 50 (can’t wait to try this one! ).